September 08, 2018 at 4:05 pm. 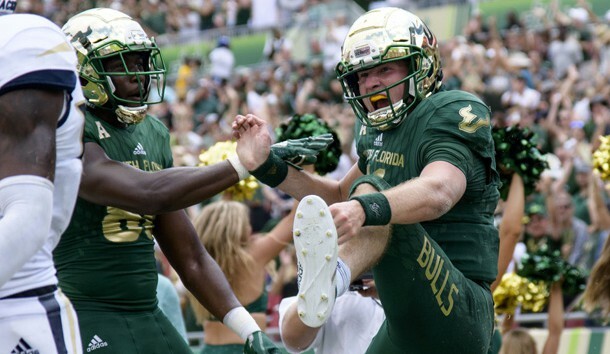 Georgia Tech’s dual quarterback threat of TaQuon Marshall and Tobias Oliver had the big numbers, but it was South Florida quarterback Blake Barnett who stole the show as the Bulls dropped the Yellow Jackets, 49-38, at Raymond Jams Stadium in Tampa. Down 38-35, Barnett and the Bulls took over on their own 12-yard line after linebacker Nico Sawtelle recovered a fumble. USF then marched 88 yards in 10 plays with Barnett capping the drive with a 19-yard run to give USF a 42-38 lead with 5:08 remaining. On the subsequent Georgia Tech drive, Sawtelle had an interception to stop the next drive after Marshall was disrupted by a Bulls blitz. South Florida took over on the Georgia Tech 18 and once again Barnett got the call as he ran the same action with the off-tackle decoy to Jordan Cronkrite on the left side. He kept off the right and scored to put the game away on a 5-yard run. Freshman Terrence Horne, Jr., wasted little time introducing himself to the South Florida fan base and the nation as his blazing speed was on parade early in the first quarter when he returned successive kickoffs for touchdowns. His first came on a 98-yard run up the right side of the field and then the 5-7 dynamo from Miramar, Fla., took the next kickoff up the left side line for 97 yards for his second score as he capped a huge first quarter with back-to-back kickoff returns for touchdowns. “We know he has the speed, so he plays inside slot and in practice; he runs by people all the time when we throw the deep ball,” said Strong. He nearly returned the opening kickoff as well when he broke into the clear but was tripped by the last Yellow Jacket available on their special teams. Horn set a USF Bulls record with 229 return yards in the first quarter as the 98-yarder was the third longest return in USF history. After that second score, Georgia Tech kicked the ball short which led to a rousing plethora of boos raining down on the sun-drenched day in Raymond James Stadium. Horne scored his third touchdown of the afternoon on a bubble screen on a 3-yard touchdown pass from quarterback Barnett which cut the Georgia Tech lead to 38-35 with 12:11 remaining in the game. Oliver came off the bench, replacing an injured Marshall to start the second half, and paced the Yellow Jackets to three time-consuming touchdown drives that all ended with him scoring a touchdown. Georgia Tech took a 38-28 lead early in the fourth quarter on Oliver’s 1-yard sneak as they had dominated the line of scrimmage and seemed to have the Bulls corralled. Oliver ran a quick-paced rhythmic offense at the outset of the second half as Georgia Tech trailed, 21-17, at the break. He immediately orchestrated a 7-play, 69-yard drive that ended with Oliver’s 5-yard touchdown run as the Jackets regained the lead some three minutes into the third period. Oliver was good for a second time-consuming drive as well, as he marched the Yellow Jackets 75 yards and did the honors from four yards out. This came after a 14-yard touchdown run by freshman Duran Bell as USF took a 28-24 lead with 8:53 to go in the third quarter. Marshall had a stellar first half, running for 98 yards on 10 carries that included a 45-yard touchdown run. This supplemented his score with an 81-yard touchdown pass to Clinton Lynch which gave Georgia Tech a 10-7 lead midway through the first quarter. He returned in the fourth quarter, but was ineffective due to the opportunistic Bulls defense.